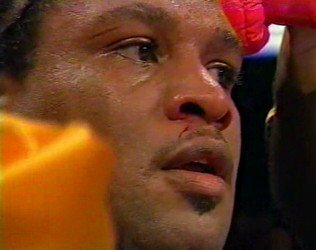 By James Slater: In compiling a fine 35-6(30) pro record, “Relentless” Lamon Brewster gave fight fans some incredible heavyweight fights. Lamon, who became WBO champ in 2004 (and defended the belt three times) is best known for his big upset stoppage win over the mighty Wladimir Klitschko. No fighter since has been able to do what Brewster did some eight years ago, and the Indianapolis warrior’s legend has certainly grown some as a result. Here, in an interview I conducted over the phone with Lamon, I get a chance to ask Brewer about his key fights. J.S: It’s great to be able to speak with you, Lamont. You had a great, exciting career, and you scored a number of KO’s – one over Wladimir Klitschko of course, and I’ll come to that later. But you were such a tough guy – who hit you the hardest in your career, amateur and pro? Lamon Brewster: I’ve been asked a few times before who the hardest puncher I ever met was. I must say, It wasn’t anyone I actually fought, it was a guy I sparred. A guy named Lionel Butler – wow, he hit so hard it was ridiculous! I sparred Lennox Lewis, Michael Moorer, Frans Botha – all hard punchers. But no-one hit like Butler. Why he never made it? It’s real simple: Coke. As soon as he began to make it, he looked to score some drugs. Had it not been for that, I’m sure Lionel would have been champ. J.S: And of all the fights you had, big and small, which would you say was your toughest? L.B: The toughest fight of my career was the fight I had with Sergei Liakhovich. I had broken my nose in sparring for that fight, and by the time of the actual fight, during the last week of preparation, the nose had healed up and I couldn’t breathe properly. I could only breathe out of one nostril for all 12-rounds. Plus I was blind in one eye due to my detached retina (Brewster reportedly suffered the eye injury in the first-round of the Liakhovich fight). Everything was against me that night. I couldn’t pull out because there was so much pressure from my promoter. I was half blind and in a lot of pain that night, and I still almost beat him. J.S: Now onto your great nights: what was your very best night in the ring? L.B: My best night ever has to be the night I beat Wladimir Klitschko; although there are a couple of other fights I could say. All my life I had asked God to let me become world heavyweight champion. And I give that victory [over Wladimir] to God. It was a bitter/sweet win, because I’d just lost my beloved trainer, Bill Slayton, who was like a father to me. But my trainer’s dying wish was for me to beat Klitschko and become champ. It took me around nine-months for that win to truly sink in. I had done it! J.S: And the opposite to that: your worst night in the ring? L.B: Oh, my worst night is an easy choice: my loss to [Sergei] Liakhovich. I had to fly to California for eye surgery after that fight. I had a lot of people there who had supported me, and I guess loved me. But in hospital, not one person came to see me. My wife was pregnant at the time and no-one checked on her either. As I’ve said, I was not fully healthy for that fight – what with my eye and with my breathing – but people still tell me that fight was one of the last great action heavyweight fights. I wanted a rematch so bad. We both know he could never beat me at my best. J.S: You had old-school trainers and you came up the hard way and learnt a ton in the gym. Who was the best fighter you ever sparred with? L.B: It’s so hard to name just one guy I sparred when it comes to the best. Lennox Lewis was great, and a good friend. Michael Moorer, James Toney – the list goes on. But I’d have to say two guys: Toney and Lionel Butler. James gave me so much experience and he always gave me advice and encouragement. Lionel, he tested me the hardest in the gym, with his unforgettable power. J.S: It’s been great speaking with you, Champ – and how we could use a warrior heavyweight like yourself today! Is it hard being retired? L.B: Thank you. Well, the hardest part of being retired is knowing I was cheated in my last fight; against Robert Helenius. There was no inspection of his gloves before the fight. In fact, his dressing room door closed two hours before the fight. I know he had something in his gloves that cut me. I had slits above both eyelids. At the time, everyone thought it was my detached retina injury that caused the loss, but it wasn’t. After the fight, the doctor told me that boxers never get cut the way I was in that fight; that it’s usually the ball of the eye. I’m not saying Helenius cheated. But his team must have. I have 31-years of experience, and I know he had to have something in his gloves. I even had to pay for my own surgery afterwards, the promoter never paid anything. I have a bitter feeling over that fight. J.S: Thank you again for a great, honest and fascinating interview! You are here: Home / Boxing Interviews / Exclusive Interview With “Relentless” Lamon Brewster, Former WBO Heavyweight Champ And The Last Man To Defeat Wladimir Klitschko!